The news of Sally Ride's death yesterday (July 23) has impacted many around the globe, most especially those who traveled directly in her footsteps. NASA's two female shuttle commanders: Eileen Collins, at left, and Pamela Melroy, at right. "She never sought media attention for herself, but rather focused on doing her normally outstanding job," Collins said. "Her 'Sally Ride Science' programs have reached thousands of middle school girls, giving them the confidence to stay focused on math and science, even when the mass media message was otherwise. She also played a notable role in both the Challenger and Columbia accident investigations. Sally left us too soon. God Speed Sally, you will be greatly missed." Collins and Melroy are not the only women to have commanded space missions. NASA's current chief astronaut is veteran spaceflyer Peggy Whitson, who commanded the International Space Station's Expedition 16 mission in 2007 and 2008. The space station's second female commander, Sunita Williams, is on the orbiting laboratory now and will take command later this year. "The selection of the 1978 Astronaut Class that included Sally and several other women, had a huge impact on my dream to become an astronaut. The success of those woman, with Sally paving the way, made my dream seem one step closer to becoming a reality," Whitson said in a statement. "I met Sally for the first time on her speaking tour after her first flight, shortly after I had graduated from Wellesley College," said Melroy, who retired from NASA in 2009 and now works at the Federal Aviation Administration's Office of Commercial Space Transportation. "She was fascinating, smart, humble, very nice - and completely inspirational." 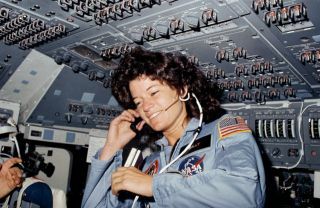 Sally Ride died at age 61 in San Diego, Calif., of pancreatic cancer.